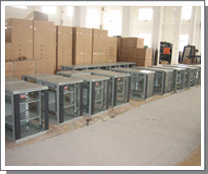 ETON, Shenzhen Eton electromechanical science & technology Co., Ltd., specialized in enclosures for data communication equipment from basic 19" RACKS, CABINETS and ACCESSORIES, COMMUNICATION RACK CABINETS, SERVER RACK CABINETS to an extensive variety of panels and accessories. ETON accumulated experienced elites in its industries. Highly modern and flexible machinery ensure highest standards of quality, considerable flexibility. just-in time and high efficient space using shipment, statistical process control, and ERP/MRP managed by total quality management and continuous improvement programs for your volume production needs. in ever-expanding customer base and supply-chain with exporting many countries and the share for export is 90% of the total revenue. Innovation, gumption, reciprocity & faithfulness are the spirits of ETON. 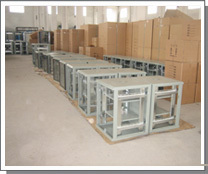 Our products keep to the best quality principle, and take the satisfaction of client as the highest goal. Let’s make the glorious future together!